Recently a client of mine wanted a refresher on the one of the most unnoticed and under utilized tool within WordPress – The “Press This” button. Installation on your browser is a snap and is supported with all major browsers including Firefox, Chrome, Safari, Opera and IE-9. (Earlier version or IE do not support this bookmarklet). On your WordPress back-end navigate to “Tools/Available Tools” (See image on the left). You will see the Press This button a short ways down the page. Using your mouse, simply drag this button up to your favorites bar. Now, to use the bookmarklet tool, all you need to do is highlight text, images and/or video on a webpage that you want to share in a new post and then click the “Press This” button on your favorites bar. (refer to the image on the right below). 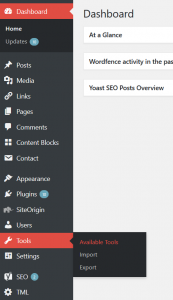 If you are currently logged in WordPress site, a new post will be automatically generated. If you are not logged in, you will be prompted to login prior to the automatic post generation. post along with a link to the original site. I an a strong proponent of acknowledgment to original author and site where the content came from.